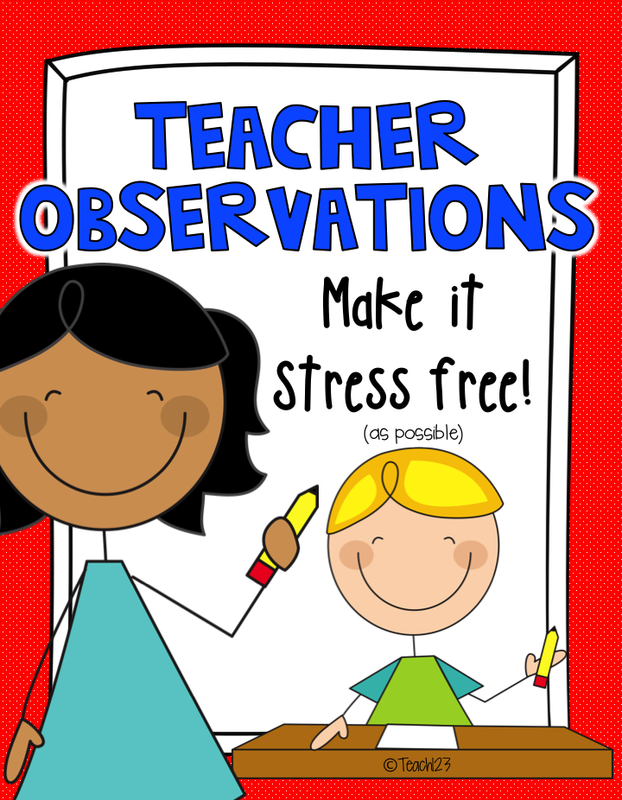 How often are you observed by your principal? I have taught in different districts in different states. It seems like each district has a different policy when it comes to teacher observations. One thing that all of these observations shared was the ability to induce anxiety in even the most experienced teacher. Whether you are a first year teacher or a seasoned teacher, rest assured that we all feel a few butterflies when it is our turn to be observed. There have been a few things through the years that I have found that helped me feel a little more comfortable when it was my turn in the hot seat. This is probably just a personal quirk of mine, but I find it relaxing to clean. 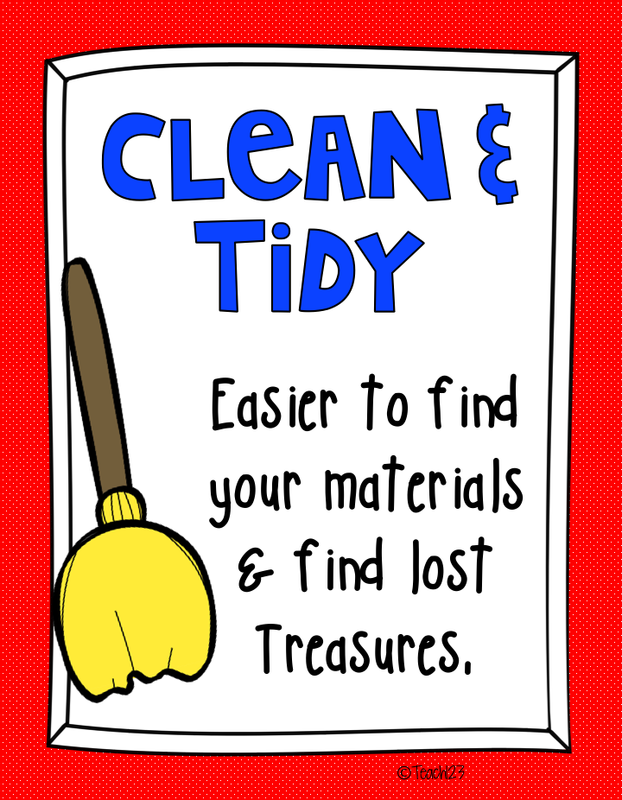 Odd quirk, I know, but when I am stressed I like to dig in and clean. I once had a very intuitive custodian that noticed that I rearranged my classroom when my class had a bad week. My thought was, a new student to sit next to, might solve the chatting issue or other classroom management problems. Most of the time this did solve many problems. I wouldn’t change the seating chart the day before an observation, but it can be very helpful to do it a few days before. Differentiation is part of all evaluations. One way to enrich your bright students is with your questions during your lessons. Asking higher order level questions and extending your lesson this way is easy to do and models great thinking for all of your students. I student taught in a self-contained gifted and talented classroom. One of the things I noticed in the GT classrooms was some type of poster or bulletin board with Bloom’s Taxonomy. I made my own version with the flower pots you see in the picture above. On the leaves are words that remind me how I should use this with my lessons. I usually hang these on the wall that I face when I teach. The visual reminder is helpful during all lessons and especially evaluations when you might be a little anxious and forget to do something. You want your students to be engaged and doing high quality work with the assignment you give them at the end of your lesson, right? 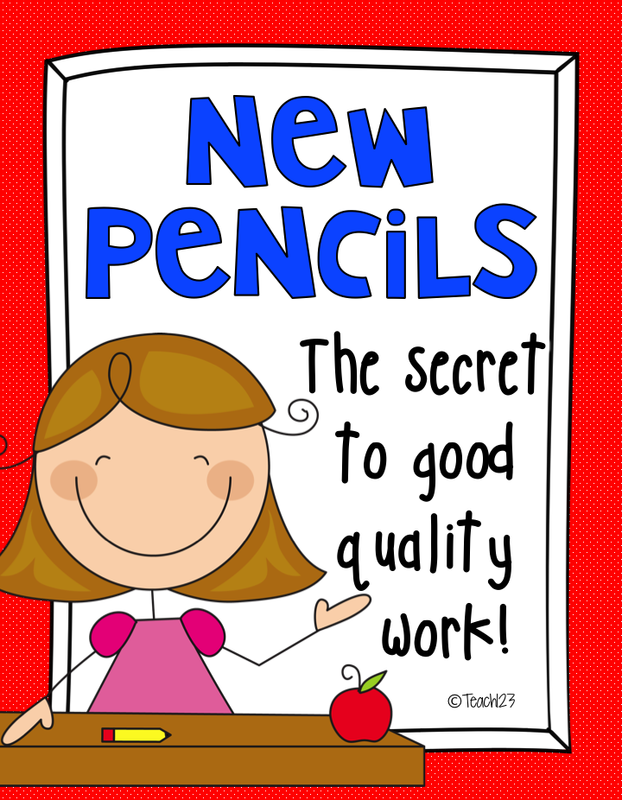 The best way I have found to do this is to give my class a new freshly sharpened pencil to complete the assignment. There is nothing like a new sharp pencil to get everyone’s attention. Make sure all of the pencils are the same or it will cause a distraction. One time I bought a new packet of pencils that had different colors which caused a squabble because some students wanted a certain color. Have a few extras in case one or two of your students break the lead. 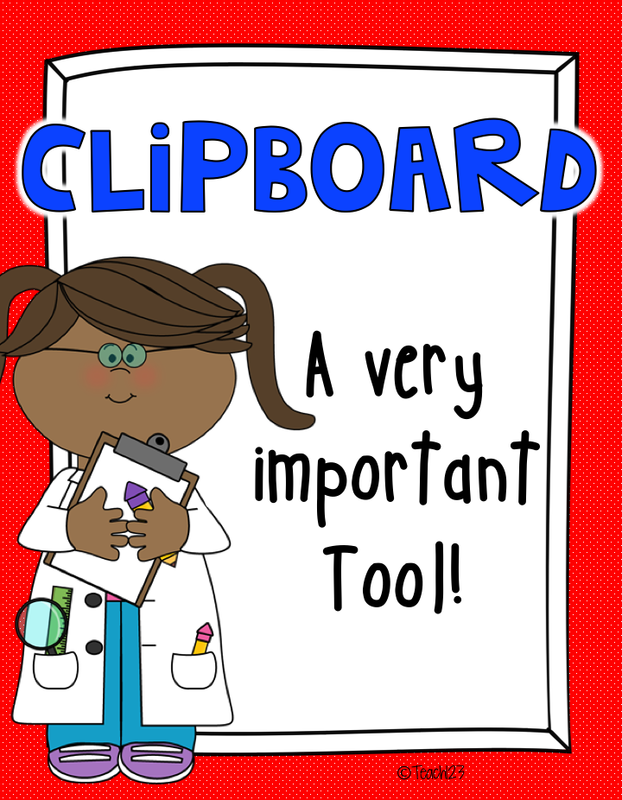 Behavior management – if I had a challenging class or a student that was on a discipline plan, this clipboard went with my class to specials and lunch. Attendance/lunch count: even though many districts now do this electronically, I still like a paper copy. Misc. : This is for all of those extra things a teacher has to deal with like book orders, field trip, PTA fundraisers. I keep extra class charts on this clipboard so I can document who brought in their paperwork. This is much quicker than digging through a pile of envelopes of stack of paperwork. Groups: each group has their own clipboard I keep track of testing, notes, observations on the clipboard until I am either no longer need the information and can file it or can throw it away. ***MY BRAIN***: I keep an outline of my plans, schedule, and other important information. This clipboard is usually full of post its because there are usually changes like assemblies, pullouts, staffings, change in how a student goes home and all of the other details we have to keep up with on a daily basis. It is a funny story about how my clipboard called “My Brain” got its name. One day I couldn’t find this clipboard. Keep in mind, this is my most important clipboard. It has all of the details that I have to keep track of for the week. You know all of those memos, notes from parents, emails from parents/team leaders/administrators/reading specialist, and calendar of events that we are responsible for on a daily basis. I had tried different methods to keep up with all of those details and eventually I began using the clipboard. It is small, portable and fits anywhere that I need to put it. I had looked everywhere and by the time my students arrived I was getting frantic. I explained to my students that I needed their help to find my very important clipboard. They wanted to know why this was so important. I told them that it helped me remember things. So, one of my little boys asked me if it was my brain. I said yes, at times it feels like it is like my brain, helping me think and remember things. After that, my class always called my red clipboard “My Brain” and it was never lost again! During evaluations, I usually put a more detailed outline of my lesson on “My Brain” which is usually near me when I teach. I look at it as my little insurance policy to make sure I cover all that I want to plan. Do you have any teacher evaluation tips to share? I just love your brain! Thanks for the great tips! I am getting observed on Thursday. 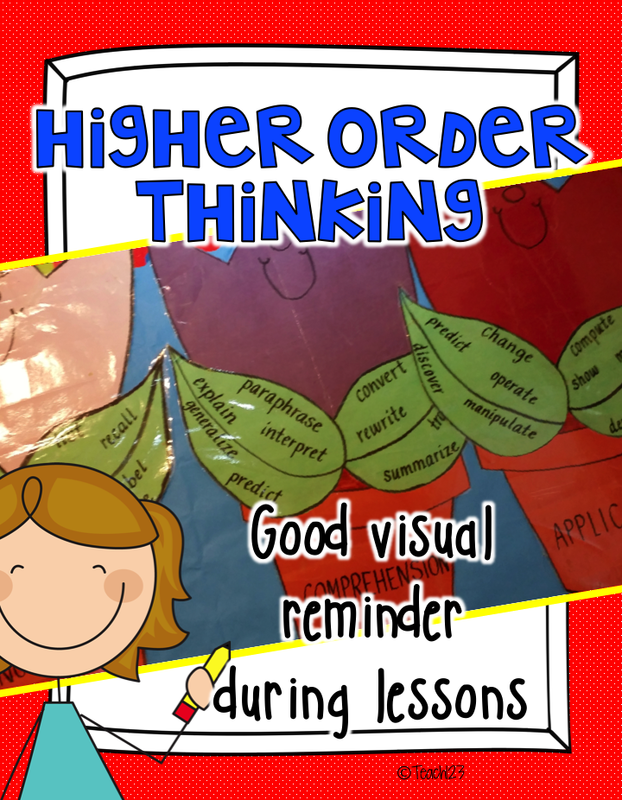 This weekend, I am making a poster with higher order thinking words! AND we are all getting new pencils first thing that morning. Thanks, BlogFriend! I have my 2nd evaluation coming up soon and I am almost more nervous this time than last. Maybe it is because I expect more from myself now that I have been teaching for a bit. I know I am doing what I am suppose to do in the classroom, but I still have many weaknesses and I want everything to go perfect. This article gave me some great things to think about when that say coma. Thank you!!! Such fabulous suggestions! Little things really make such a difference! Love the new pencils! I love all of your ideas! I am just thankful our district doesn't do the formal observations any longer. A formal evaluation is nothing more than a "dog and pony" show. Our principals actually visit our classrooms on multiple occasions (weekly), unannounced and at various times in the day. They may stay 2 minutes or as long as 12-15 minutes…but, they are actually observing us interacting with our students and seeing what we do every day. This is like formative assessment, which provides more accurate evaluation data and feedback. There isn't a teacher that I know, that doesn't prefer this type of evaluation at my school. No need to get nervous, prep for the perfect lesson, worrying about what questions you have to ask, etc. There isn't any other profession that is evaluated on their performance based on one formal evaluation. We love seeing our principal wonder through and know what we are working hard on. The students really enjoy seeing him also. Try suggesting it to your principal or district.